The successful Maroon Day organizer was Her Excellency Dr. Ambassador Fidelia Grand-Galon who invited Pompey Fixico and the other delegates to Suriname, a country of half a million people and 120,000 maroon descendants of enormous ethnic diversity. The 2015 National Celebration of Maroon Day recognizes the 255th Anniversary celebration of the “Peace Treaty” signed in 1760 by the Dutch Colonizers in favor of the Maroons, who won their Freedom from the Dutch oppressors through arduous combat and also won the land that they resided on. We all salute Maroon Day organizers who have for the first time bought together maroon descendants from all of the Americas. 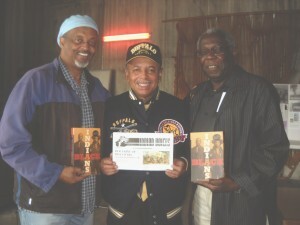 William Loren Katz is the author of Black Indians and 40 other books on African American history. His research, writing and lectures have earned widespread praise from noted scholars such as John Hope Franklin, Henry Louis Gates, Jr., John Henrik Clarke, Howard Zinn, James M. McPherson, Alice Walker, Cornel West, Ivan Van Sertima, Betty Shabazz and Dr. Ralph Bunche.